Platform-as-a-Service startup Mercury Commerce has released its first self-developed product to the market, with the launch of the Hire My Trailer app and website. 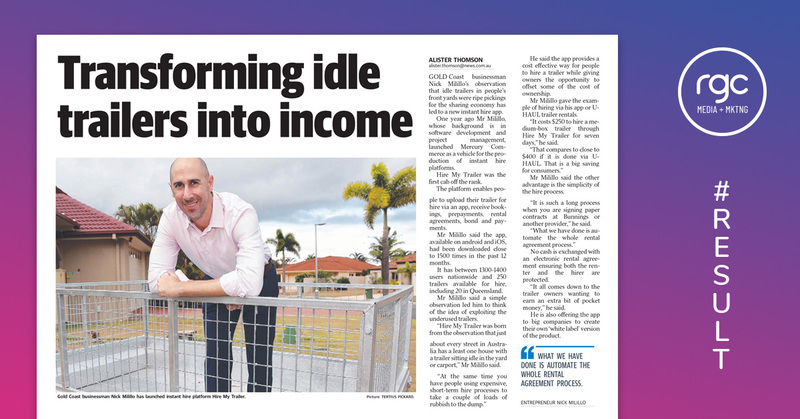 After nearly 12 months of beta and in-market testing Gold Coast based Mercury will be rolling out the fully featured Hire My Trailer platform in key markets across Australia over coming months. Hire My Trailer was developed to demonstrate the efficacy of Mercury’s instant hire platform that allows any business or industry with excess equipment to generate an income by renting it out. Founder Nick Milillo said the Mercury platform could be white-labelled and allows businesses to simply feed in their inventory and market to customers. “Any business that has idle equipment can now rent it out quickly and efficiently and turn something that is costing money to do nothing into a revenue,” he said. The Hire My Trailer business was created to test and market the platform and enables person to person trailer rental, by putting under-utilised trailers to good use. “Hire My Trailer was born from the observation that just about every street in Australia had a least one house with a trailer sitting idle in the yard or carport,” Mr Milillo said. “At the same time you have people utilising expensive, short term hires to take a couple of loads of rubbish to the dump. The platform allows people to upload their trailer for hire via an app, receive bookings, pre-payments, rental agreements, bond and payments. No cash is exchanged with an electronic rental agreement ensuring both the renter and the hirer are protected. The process for trailer hirer is as simple as putting your location into the app, choosing a trailer and booking. Once the owner accepts the booking the fee is charged to a credit card via secure payment provider.